People love New York City because of all of the hustle and bustle. So much opportunity! If you can make it here you can make it anywhere! It’s the city that never sleeps! No wonder we’re so stressed out. Meditation can be a powerful tool in helping you to focus, calm yourself, or seek answers to a problem that you are having. In my meditations, I have experienced various kinds of visualizations, from out-of-body experiences to seemingly traveling to far off places… But this doesn’t always happen. Sometimes it can be very hard to focus; my mind wanders, or an outside element distracts me. This setback has caused me to start looking for new places to meditate, or maybe a class. My search brought me to Nap York, located right near Penn Station. (Conveniently located for commuters who might have missed their train and need a place to chill while they wait for the next.) Nap York provides various services: the first floor is the Nap York Cafe, which I haven’t tried, but serves a variety of healthy looking organic fare. At the cash register you can enroll in a yoga or meditation class, or you can reserve a private nap pod. I had received a token for a free 30 min nap pod, so that is what I tried out. I was told to walk up the stairs to the fourth floor, and to go into Pod 19. Admittedly, I was a little nervous – it was VERY dark and quiet. I was worried about making a noise and disturbing someone. When I got to the fourth floor, I found a wall of giant cubby holes. It was like a pod hotel; there were 2 rows of pods stacked one upon the other, with little steps to get into the top row pods, if that’s where you were assigned. Along the opposite wall were leafy green plants and a humidifier or some kind of incense burner. It wafted out a light, pleasant smelling fog. Inside the basic nap pod is what you see in my photo: a pillow, a blanket, a little shelf with what looked like ear buds, and a strobe light. I say strobe bc it flashes briefly occasionally to give you your bearings without turning a light on. I have a feeling if I had messed with it, I could have turned the light on and used it for a reading light or something. But that’s not why I was there. I crawled into my little pod, drew the black curtain closed, and turned on one of the guided meditation recordings I have on my phone (using my own ear buds bc that’s not the kind of thing I like to share with strangers lol). On the top of each pod ceiling was a small sea of illuminated stars. I felt that the nap pod was a great place to meditate. While there were a few dim lights in the pod, the overall deep darkness of the space allows you to really tune into your other senses. My meditation was deep and refreshing, and the time went by quickly. 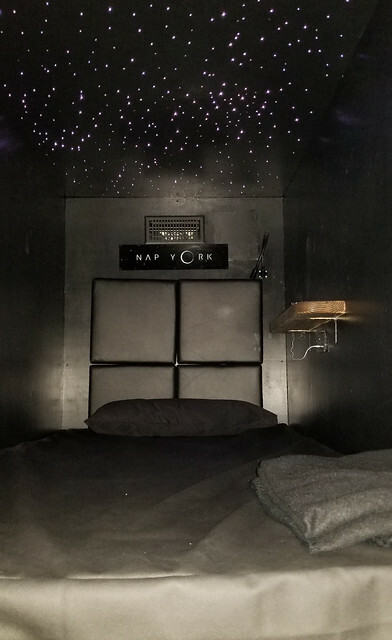 I definitely recommend Nap York for someone who needs a quiet escape, even if for just a half hour. (You can absolutely book much longer reservations, btw.) I am extremely interested in checking out one of their guided meditation classes. The “studio” space reserved for classes looked really small. I saw two girls warming up for a yoga class on the second floor, and their studio space was simply a part of that room, sectioned off by large planters. I would imagine if there was a class with more than 5 students, it would be very cramped. I had a headache basically as soon as I left. Not sure if that was going from the darkness to the light or what, but that was kind of weird. Do you have any secret spots like this that are good places to escape? Let me know where you go to recharge, I’m open to new ideas! !